Q: Somehow we have managed to lose our access credentials. Is there a hard-coded access mechanism to allow access to the system again? A: You can use "lost password" feature to generate a new password. It will ask you for your login name and sends a link to your email address that allows you to generate a new password. What if "lost password" feature doesn't work for you for some reason? If this feature doesn't work for you for some reason, for example if SMTP is not configured in your KMP installation, or you do not remember your login, you can change your password right in the database. Open KMP database using a database management software like phpMyAdmin or HeidiSQL, for example. Find the entry for your user. and generate MD5 hash for your new password, for example "admin123". Copy-paste generated hash to the "passw" column of your user entry in the DB. You can also find your username at "login" column of your user entry. Now you can login using your username and new password. You can reset password directly by editing database only if KMP installed in your environment. 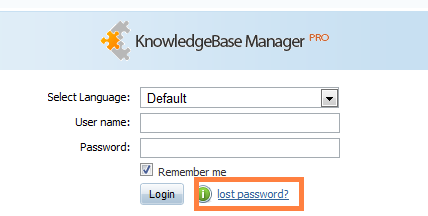 If you're using the hosted knowledge base, you can contact us for password reset.